We begin our story with a 39 year old fridge repairman employed with a bustling repair company. During one of Adelaide's usual sunny mornings, he experienced a sequence of rather disturbing events. Upon waking, he had a headache, and his right arm was weak; he paid little notice initially, as the arm improved a few minutes later. As our repairman went about his morning, however, he noticed that the right arm weakness reappeared for several minutes, recovered again, then reverted back to a state of weakness; his strength continued to fluctuate like this for the next hour or so. Our repairman became more concerned - really, who would not be - and he tried to express these developments to his girlfriend. Unfortunately, what he said did not quite make sense to her. To his shock, he had severe word-finding difficulties - he knew what he wanted to say, but the words came out in a jumble. The speech improved several minutes later, but at this point he felt that he had experienced quite enough, and asked his his girlfriend to drive him to the emergency department of our hospital. Our repairman was attended to by our busy emergency doctors, who obtained a bit more history. The night before, he had been visiting some friends who were dabbling in a bit of alcohol as well as amphetamines (commonly known as speed). Our repairman had a few drinks and, while he claims that he almost never abused illicit substances, proceeded to snort back some of the powdered amphetamines as well. He suddenly felt his heart rate pounding away rapidly, but no more than that, and he drove home to his girlfriend at a reasonable hour. No significant medical history was noted, although he had smoked cigarettes for nearly 30 years. He took no regular medications and had no allergies. The emergency doctors performed a quick examination. No speech deficits were noted, and the right arm seemed fine. They ordered some blood tests which all came back normal. Finding nothing wrong, the emergency doctors diagnosed drug-induced disorientation and sent our troubled repairman home, asking him to see his GP for a computed tomography (CT) scan (a three dimensional x-ray) of the head. The GP dutifully performed a CT head the next day. This is part of the top of the brain (left on the scan equates to the right side of the brain and vice versa). It is normal aside from a small white "spot" on the left side of the brain. This was reported by the radiologist as a small area of calcification suggestive of a previous infective or inflammatory episode. Further down, there is an area of hypodensity (look at where the arrow is pointing - there is a slightly darker area on the left side of the brain). This is an ischemic stroke (an area of the brain that has died after being deprived of oxygenated blood for too long). 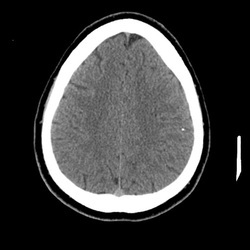 In a two-day old stroke, the hypodensity is faint and the borders of the stroke are not sharp. In a month, the area will be black with sharp borders. Near the bottom, another white "spot" (larger than the one seen in the first image) can be seen on the left side of the brain. Again, this was reported by the radiologist as a small area of calcification suggestive of a previous infective or inflammatory episode. The finding of a recent ischemic stroke on the CT scan prompted the GP to phone our repairman later that day and instruct him to come straight back to hospital, where I admitted him directly into our stroke unit. On brief inspection, he was an enormous gentleman of European ancestry, with the build of a professional weightlifter. When I attempted to gain more history, he mentioned that his right arm was still intermittently weak, but only during mornings. I also discovered that he had been found to have a bicuspid aortic valve (the aortic valve is one of the four valves of the heart - it normally has three leaflets, but in 2% of the population it has only two leaflets) as a child. Bringing out my stethoscope, I noted a systolic ejection murmur (an abnormal heart sound that usually occurs when a valve is too narrow) over the location of the aortic valve. His right arm was strong, his speech was fluent, and the rest of the neurological examination was normal. From the CT scan, we knew that our repairman had suffered a small ischemic stroke, but now the real work began - we had to find out where the stroke had come from. Ischemic strokes usually arise from a blood clot that has been released from somewhere else in the body and moves as an embolus (any detached mass travelling within a blood vessel) to lodge inside one of the arteries supplying the brain. When one of these arteries is blocked, the area of brain that it supplies suffers ischemia (deprivation of oxygenated blood) and given enough time, eventually dies. The ultimate source of the blood clot is usually the mystery. It may form within excessively turbulent blood flow in the heart (which commonly results from abnormal heart rhythms such as atrial fibrillation, a recent heart attack, or several other conditions); it may arise from blood exposure to a ruptured atheromatous plaque (an abnormal thickening in an arterial wall that accumulates calcium and fatty material); or it may arise from a thrombotic disorder (where the blood clots too easily as a result of a genetic predisposition or some other disorder, such as cancer). This list is by no means exhaustive; there are plenty of places and ways in which an embolic blood clot may materialize. Moreover, the embolus resulting in an ischemic stroke is not always a blood clot - less commonly, it may be a fat globule, which can occur following a broken bone, or a gas bubble, which can occur after trauma or scuba diving. While I had noted the radiologist report on the CT scan, the white "spots" did not sit well with me as I had never seen anything like them before. I needed to see what was happening within the arteries of the head, and thus ordered a magnetic resonance imaging (MRI) scan (a radiological technique that uses strong magnetic fields and radiowaves to assess the movement of water molecules within body tissues, creating a nice anatomical image) of the brain with a magnetic resonance angiography (MRA) scan (use of an injected contrast agent to outline the blood vessels) of the cerebral circulation. The MRI scan confirmed the stroke that had been noted on the CT. The white areas on this MRA scan represent contrast flowing within the arteries that supply blood to the brain (again, left on the scan equates to the right side of the brain and vice versa). The arteries are pristine, except for one anomaly - the circled area on the left side of the brain. If you look carefully, you will notice that the contrast seems to disappear at one point in one of the arteries, after which flow is resumed. This indicates that there is a focal narrowing of this artery - the left middle cerebral artery, to be more precise. 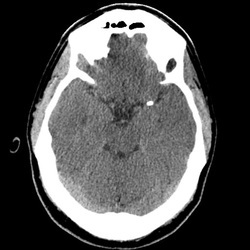 The narrowing in the left middle cerebral artery was concerning, as the ischemic stroke noted on the previous CT scan had been supplied by this artery. It was tempting to surmise that this narrowing - however it got there - was choking off the blood supply to part of the brain of our repairman. The narrowing could have arisen for any number of reasons -perhaps an embolic blood clot from the heart, or a ruptured atheromatous plaque in the wall of the artery itself. However, remembering the white "spots" we had noted earlier, I wondered whether we were really dealing with a blood clot here, or perhaps something else. It was at this point, on the second morning of admission, that our repairman suffered yet another episode of right arm weakness. I rushed over and performed a speedy examination, making two observations. First, his right arm indeed had subtly reduced power compared to the left arm. Second, when I asked him to describe and name a few items, he had a bit of trouble finding some of the words, indicative of a mild degree of expressive aphasia (a speech disorder marked by a reduction in the ability to produce language). His symptoms all improved spontaneously within five minutes. On the surface, this did not make sense - he had suffered the stroke already, yet he was still having fluctuating weakness and intermittent expressive aphasia. It was as though the brain areas for right hand strength and speech generation were getting enough blood at certain times of the day, but not enough during other times. I wanted to clarify what was happening further, and we rushed our repairman down to the CT scanner for a computed tomography perfusion (CTP) scan. A CTP scan looks at blood travelling within an organ such as the brain (as opposed to angiography which looks at blood travelling within vessels). While normal CT and MRI scans can clarify whether a stroke has occurred or not, CTP scans can clarify whether the current blood flow within the brain tissue is adequate enough to keep the brain alive, and thus whether a stroke may occur or not. If the blood flow is too low to a certain area of the brain, yet that area is not dead yet, it can be reasonably predicted that a stroke will probably occur soon if nothing is done to enhance the blood flow. This CTP scan shows the rate of blood flow within the brain (as usual, left on the scan equates to the right side of the brain and vice versa). The blue and green areas represent adequate blood flow and the red area represents inadequate blood flow. The gigantic red area is the part of the brain fed by the entire left middle cerebral artery - the artery is getting some blood to this area, but just enough to keep this area of the brain alive. This red area is called the ischemic penumbra (the area of brain that is still alive, but ischemic and thus under threat from the reduced blood supply). I took a bit of time to assess the information at hand. The CT scan currently showed that, for the moment, we only had a small left middle cerebral artery territory stroke and small white "spot" in the vicinity of that stroke. The MRA scan had pointed out a focal narrowing of the left middle cerebral artery, a narrowing that was suspiciously close to the location of that white "spot". The CTP scan warned us that although only a small area of brain had died so far, a much larger area of brain, the ischemic penumbra, was under threat. The pieces of the puzzle were starting to merge together, but we still did not know our enemy - the source of the stroke. We had visualized the arteries, one of the usual suspects where a blood clot may develop, but there was one other that we had thus far neglected in our desperation to image the brain. It was time to look at the heart. Our excellent cardiologists quickly performed a transthoracic echocardiogram (TTE) ultrasound (using oscillating sound pressure waves to outline the structure of the walls and valves of the heart). There was only one abnormality noted, but a highly relevant one - the bicuspid aortic valve in our repairman was heavily calcified. Finally, we had the diagnosis we had been seeking for - our troubled repairman had a left middle cerebral artery ischemic stroke secondary to a calcium embolism from the bicuspid aortic valve. An ischemic stroke may occur when an embolism from elsewhere in the body travels into the cerebral circulation and obstructs one of the arteries supplying the brain. If the area of brain fed by that artery is deprived of oxygenated blood for too long, it becomes ischemic, and the neurons in the ischemic area stop functioning and eventually die if blood flow is not restored. The left middle cerebral artery supplies most of the left neocortex (a thin 2-3 mm thick sheet of neurons enveloping the rest of the brain). The left primary motor cortex contains neurons involved in initiating right arm movements. The left medial insular cortex is involved in generating speech. These two areas are located closely together, and both are supplied by the left middle cerebral artery. 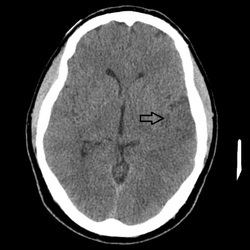 In this case, the blood flow was compromised enough to result in the death of some brain tissue (accounting for the stroke seen on the CT scan), but around that area was a lot more brain tissue that was intermittently dysfunctional (accounting for the ischemic penumbra seen on the CTP scan). In acute stroke management, the number one priority of any clinician should be to save brain tissue in the ischemic penumbra before it dies and becomes a completed stroke. Calcium emboli are extremely rare. Compared to tricuspid valves, bicuspid aortic valves (two leaflets) become calcified much earlier in life, at around 50 to 60 years of age (Beppu et al, 1993), probably secondary to the increased mechanical or tensile stress from increased blood turbulence (Otto, 2002). This sets up an inflammatory reaction that, over years, results in the heavily calcified valves (Otto, 2002). There are only a few case reports of calcium embolism occurring in other patients (Rancurel et al, 1989), but what triggers a chunk of calcium to break off the valve is not understood. We can only surmise that the amphetamines taken by our repairman may have accelerated his heart rate enough to result in a substantial amount of acute stress on the calcified valve leaflets such that a couple of pieces broke away. The optimal treatment for ischemic stroke secondary to calcium emboli is nanyone's guess, but aspirin (a thromboxane inhibitor that prevents platelets from aggregating) and intravenous heparin (an anticoagulant that activates a protein called antithrombin, which in turn inactivates several enzymes in the blood clotting system) both seem reasonable. The stroke site in this case was the left middle cerebral artery, which supplies a lot of brain (red), including the left primary motor cortex (involved in right arm movements) and the left medial insular cortex (involved in speech generation). In 98% of people, the aortic valve is tricuspid (three leaflets, top right of the diagram). In a less fortunate 2% of people, the aortic valve is bicuspid (two leaflets, bottom right). Bicuspid valves calcify readily and at a much earlier age compared to tricuspid valves. The stroke source in this case was a calcified bicuspid aortic valve. Time to get replaced. As soon as the ischemic stroke was diagnosed on the CT scan, we initiated treatment on our repairman with aspirin. When he continued to display fluctuating symptoms, we stepped up our treatment with intravenous heparin. We still did not know what we were dealing with at that point, but aspirin clearly was clearly not adequate, so it was reasonable to commence the heparin. His symptoms resolved with the heparin - this suggests that there may have been a bit of blood clot involved in the formation of the stroke as well, but we will never be certain. Despite the success of the heparin, our repairman still had two small chunks of calcium in his cerebral circulation. We repeated a CTP scan showing that despite the resolution in symptoms, blood flow was still reduced to the left middle cerebral artery territory and the ischemic penumbra was still present. He was a sitting duck for an ischemic stroke. At this point we asked our stalwart interventional radiologist if he thought he could remove the calcium embolism by inserting a retrieval device attached to a catheter into the femoral artery of the leg and all the way up to the brain, and he answered that he believed he could. It was a difficult decision - whether to let a huge ischemic penumbra sit in the head of our repairman and hope for the unlikely event that it might spontaneously resolve, or alternatively, to attempt an invasive interventional procedure with the potential to make things worse. We chose to act. The procedure was attempted, but it turned out to be beyond the abilities of our interventional radiologist. It was not a total failure however, as he did mange to inadvertently maneuver the calcium embolism into a much smaller branch of the left middle cerebral artery with no ill clinical effects, thus relieving the main artery from the partial obstruction. A final CTP scan confirmed that the ischemic penumbra had thankfully vanished. A month later, our excellent cardiothoracic surgeons replaced the aortic valve on our repairman with a prosthetic valve, thus removing the ultimate source of the stroke. Our troubled repairman came by the stroke unit for a visit a few months later. He was back to normal, no longer troubled, and thanked us all profusely for our efforts in what had been an uncertain situation for everyone involved. As we shook hands, I noted with satisfaction that his grip was stronger than ever. Beppu et al. 1993. Rapidity of progression of aortic stenosis in patients with congenital bicuspid aortic valves. American Journal of Cardiology 71, 322-327. Otto. 2002. Calcification of bicuspid aortic valves. Heart 88(4), 321-322. Rancurel et al. 1989. Spontaneous calcific cerebral embolus resulting from a calcific aortic stenosis in a middle cerebral artery infarct. Stroke 20, 691-693.